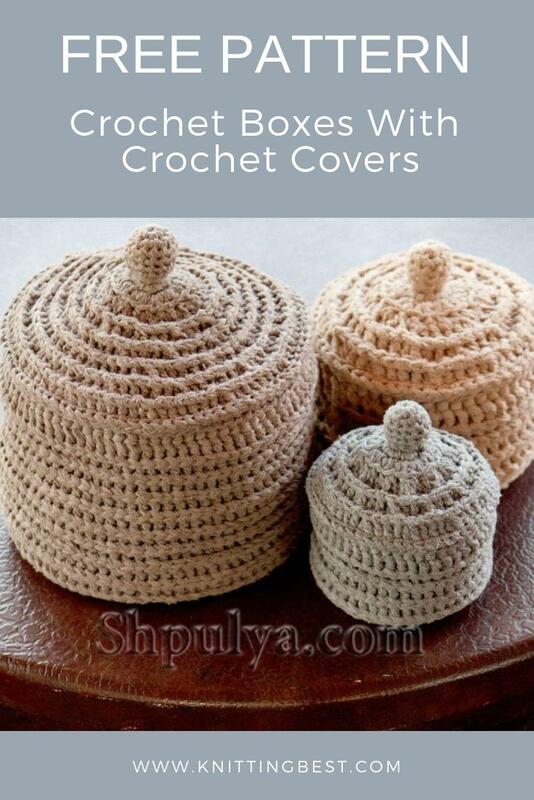 Crocheted knit boxes will not only look beautiful in any interior, you can store a lot of women's trifles in them. The boxes are crocheted from cotton yarn. Diameter 20 cm, height 13 cm. You will need: 300 g of gray-brown (color 9) yarn Paradiso Lana Grossa (100% cotton, 65 m / 50 g); hook number 4 and 4.5. Art. b / n: knit circle. R. To do this, tie a chain of 5 sur. n. and close the ring 1 comp. Art. In the 1st round. R. knit art. b / n according to the trace instructions. Every lap. R. finish the connection Art. and next a circle. R. start with 1 rev. to lift In every article b / n previous circle. R. knit only 1 tbsp. b / h Performing additions in circular p., Knit 2 tbsp. b / n in 1 tbsp. b / n = number of loops doubled. Relief art. rear: knit circle, p. Every lap. R. start with 2 rev. n. instead of the 1st relief art. and end the connection. Art. in the 2nd air. to lift In each relief. Art. previous r. knit 1 relief. st., and knit as st. s / n, but clasp back to the top of the station. previous r. The resulting pattern resembles a rubber band. Knitting density: 13 tbsp. b / n and 14 circle, p., hook No. 4.5 in two threads = 10 x 10 cm; 15 relief art. and 8 circle, p., hook number 4.5 in two threads = 10x10 cm. Attention: everything, except the knob-knob, knit very tightly in two threads, so that the box is stable. Description of crochet jewelry box:the bottom of the bowl start to knit from the center of the bottom. To do this, tie a chain of 5 sur. n. crochet number 4.5 in two threads. Art. b / n knit circle, in rows. Start the circle. R. note in the 1st circle. R. knit 8 tbsp. b / n In the 2nd round. R. double every n. 1st lap. R. = 16 Art. b / n In the 3rd round, p. double every 2nd n. = 24 Art. b / n In the 4th circle. R. double every 3rd paragraph = 32 Art. b / n In the 5th circle. R. double every 4 p. = 40 Art. b / n, B 6th circle, p. double every 5 p. = 48 Art. b / n In the 7th circle. R. double the 3rd paragraph, then 7 times every 6th paragraph - 56 Art. b / n In the 8th circle. R. knit on 56 p. without additions. In the 9th circle. R. double every 7th p. = 64 Art. b / n In the 10th circle. R. double the 4th p., then 7 times every 8th p. = 72 tbsp. b / n 11th round. R. knit at 72 p. without additions. In the 12th round. R. double every 9th paragraph. = 80 Art. b / n The bottom is done. For the side of the knit relief art. by 80 points without additions. Through 14 cm = 11 circle. R. from the end of the bottom to finish the product. Thread carefully fasten. For the cover tie a chain of 5 rev. n. crochet number 4.5 in two threads and short-circuited in a ring 1 conm. Art. Start r. note in the 1st circle. R. knit 10 tbsp. b / n In the 2nd round. R. knit half., and double every n. previous p. = 20 p. In the 3rd circle. R. knit art. s / n, with the hook to enter only in the back of the loop and double every 2nd n. = 30 st, s / n. From the next a circle. R. = 4 circle. R. knit relief art. back, and in each circle. R. double every 2nd n. = 45 Art. s / n In the 5th round, p. double every 3rd paragraph - 60 Art. s / n In the 6th circle. R. double every 4th paragraph - 75 Art. s / n In the 7th circle, p. double every 5 p. = 90 Art. s / n In the 8th circle, p. double every 6th p. = 105 Art. s / n Finish the cover 1 lap. R. Comm. Art. Thread carefully fasten. Handle knit like a cone: tie a chain of 3 sur. item in one thread hook number 4 and close it into the ring 1 comp. Art. Knit art. b / n circle. R. Start the circle, p. Mark. In the 1st round. R. knit 10 tbsp. b / n In the 2nd round, p. double every 2nd paragraph of the 1st row = 15 cent. b / n 3rd and 4th round. R. knit on 15 p. without additions. In the 5th circle. R. knit on 2 tbsp. b / n together - 8 p., with 2 of the adjacent Art. b / n pull out the loop and new crochet knit them together. Handle fill the remnants of yarn. Then knit the 6th circle, p., As the 5th = 4 n. With the end of the thread pull the remaining loops and leave the thread to sew the handle to the product. R. knit 10 tbsp. b / n In the 2nd round, p. double every 2nd paragraph of the 1st row = 15 cent. b / n 3rd and 4th round. R. knit on 15 p. without additions. In the 5th circle. R. knit on 2 tbsp. b / n together - 8 p., with 2 of the adjacent Art. b / n pull out the loop and new crochet knit them together. Handle fill the remnants of yarn. Then knit the 6th circle, p., As the 5th = 4 n. With the end of the thread pull the remaining loops and leave the thread to sew the handle to the product. R. knit 10 tbsp. b / n In the 2nd round, p. double every 2nd paragraph of the 1st row = 15 cent. b / n 3rd and 4th round. R. knit on 15 p. without additions. In the 5th circle. R. knit on 2 tbsp. b / n together - 8 p., with 2 of the adjacent Art. b / n pull out the loop and new crochet knit them together. Handle fill the remnants of yarn. Then knit the 6th circle, p., As the 5th = 4 n. With the end of the thread pull the remaining loops and leave the thread to sew the handle to the product. Assembly: the last lap. R. side tuck inward and sew sewing threads. To tie the top edge 1 circle. R. Comm. Art. crochet number 4.5 in two threads for durability. Handle sew to cover. Diameter 15 cm, height 10 cm. You will need: 200 g brown [col. B) Paradiso Lana Grossa yarn (100% cotton, 65 m / 50 g); hook number 4 and 4.5. Description of knitting box: knit, like a big box, but for the bottom to perform from the 1st to the 9th p. The side of the knit in height 11 cm = 9 circle, p. For the cover knit from the 1st to the 6th round, p. and finish 1 lap. R. Comm. Art. Handle knit similarly. Assembly to produce similar to the assembly of a large box, but without a circle. R. Comm. Art. Small box with a lid. You will need: 100 g of gray (color 10) Paradiso Lana Grossa yarn (100% cotton, 65 m / 50 g); hook number 4 and 4.5. Description of knitting a small box crochet: knit, like a big box, but for the bottom to perform only from the 1st to the 6th round. R. The side of the knit in height 9 cm = 8 circle. R. For the cover knit from the 1st to the 5th round. R. and finish 1 lap, p. Comm. Art. Handle knit similarly. Assembly to produce similar to the assembly of a large box, but without a circle. R. Comm. Art.